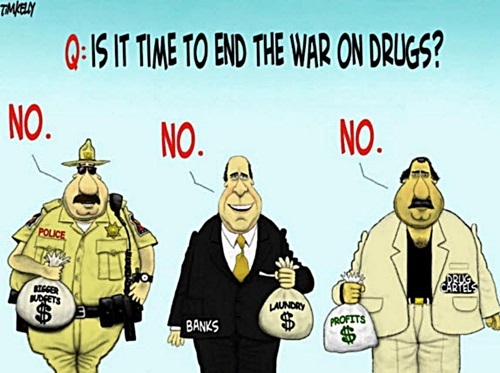 The non-partisan Government Accountability Office (GAO) has released a new report telling us what we have known for a long time; we are losing the War on Drugs. 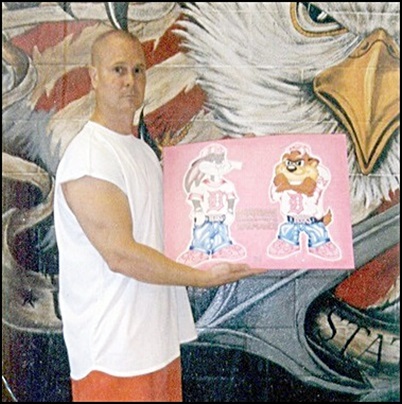 Richard J. Wershe, Jr. has been a political prisoner of the War on Drugs for almost 28 years. He’s been in prison for a non-violent drug conviction after being arrested at age 17. Numerous murderers and rapists have been convicted, imprisoned and released in the time Wershe has been behind bars. But then, they didn’t tell the FBI about corrupt cops and they didn’t help the Feds put former Detroit Mayor Coleman Young’s brother-in-law in prison for drug crimes. Wershe did. He’s been paying for it ever since. Richard Nixon, the only proven criminal to occupy the White House, launched the spectacular national policy failure called the War on Drugs in 1971. The nation has spent over one trillion dollars on the War on Drugs but it has been in retreat since the first day. In all wars, there’s money to be made. The drug traffickers are obvious beneficiaries, but we seldom look at the enormous profits of the big banks which launder the dealers’ money. Also overlooked in the War on Drugs is the inconvenient truth that narcotics enforcement is a profit center for the nation’s police departments. There’s big money in asset seizures and as part of a screwed up national policy, Uncle Sam doles out grants to local police departments for the number of drug arrests and asset seizures they make. It’s like giving them a ticket-writing quota, only in this case it's for their buy-and-bust, kick-in-doors farcical battle to make their communities safe from the drug epidemic that has continued unabated for 44 years. Another Richard, this one named Richard J. Wershe, Jr. was recruited by the federal government at age 14 to join the Detroit battle front of the national War on Drugs. He did his job as a secret informant, was dropped after the government got what it needed and eventually he turned to the only trade he knew; the one the government put him in. He briefly became an illegal drug wholesaler, was quickly caught and sent to prison for the rest of his life. Wershe was a headline sensation in the late 1980s. Gullible and/or lazy reporters and editors couldn’t get enough of the story of a baby-faced white teen who the Detroit cops and prosecutors claimed was a drug lord and/or drug kingpin. From a review of news archives from that era it is apparent that it never occurred to anyone in the media to stop and wonder how a cocky white kid could be the “lord” over street-hardened grown black men who had fought their way—literally—to the top of the narcotics underworld. Reporters and editors never asked Detroit's narcs to explain how this white kid could manage to peddle 200 kilos—441 pounds—of cocaine on the streets of Detroit month in and month out and still be alive. Reporters and editors apparently never asked if he had a gang supporting him. That would be essential for anyone moving that much dope each month. They never asked, apparently, why he was never charged with conspiracy to sell illegal drugs. Conspiracy, racketeering, operating a Continuing Criminal Enterprise (CCE); those are the usual charges against drug lords and drug kingpins. Wershe was never charged with any of that. Prosecutor O’Hair, who occupied an elective office, must have been pleased beyond measure to show Detroit's black voters that he was fearlessly going after white drug dealers, too. The prosecution of the teen the media liked to call White Boy Rick validated a widely held belief in the inner city that the cocaine epidemic of the ‘80s and the heroin epidemic of the’70s was due to a sinister and secret plot by The (white) Man to enslave the black population. Most black Detroiters knew the drug problem went beyond racism but O’Hair was pandering to the conspiracy theory crowd in Detroit and they loved it because it made them feel better. Whites have their own pet conspiracy theories about "they" and "them" on a number of issues as evidenced in modern national politics. That was the local political atmosphere in Detroit when Rick Wershe went to prison over 27 years ago. Fast forward to December, 2015 and it is obvious the War on Drugs which devoured Rick Wershe as a prisoner is a colossal and costly failure. The use of illegal drugs is as bad now as it was then. Five years ago the Office of National Drug Control Policy (ONDCP), a White House operation, set a series of goals for the War on Drugs. A new report this month from the Government Accountability Office (GAO), Washington’s official watchdog agency, says the Office of National Drug Control Policy has not met a single goal it established five years ago. Use of illegal drugs continues unabated. Not only have they not achieved any of the goals they set for themselves five years ago in the War on Drugs, in some cases the problem is even worse. Numbers are dreary and boring but a few are worth considering. Drug-related deaths account for one of the biggest policy goal failures. In 2010, the White House was dealing with 2009 figures showing drug-related deaths nationally totaled 39,147. They set a goal of reducing drug-related deaths to 33,275 by this year. They failed. The figures for 2013, the latest available, show 46,471 drug-related deaths in the United States. That's an increase of almost 20 percent over 2009. Interestingly, Detroit managed to show a decline in drug-related deaths in 2013. A cynic might say it's because Detroit's addicts are more experienced in how to abuse drugs without killing themselves.Research into drug-related deaths and hospital admissions for drug overdoses shows heroin is replacing crack cocaine as the narcotic of choice on the streets of Detroit and many other cities. No matter how the numbers are crunched or nitpicked, the fact remains the United States has failed miserably to win the War on Drugs. Internet satirists are mocking the USA for its failure in the War on Drugs AND the War on Terror. This past week a British blogger spoofed the international news media for a time with a bogus story that notorious Mexican drug lord Joaquín “El Chapo” Guzmán—who has escaped from prison twice—has issued a warning to the ISIS terrorist group to quit messing with his drug shipments to the Middle East—or else. “My men will destroy you," Guzman allegedly warned the head of ISIS in an "encrypted" email. Maybe Steve Charnock, the British satire blogger is on to something. Maybe the United States should strike a deal with Joaquín Guzmán and his murderous Sinaloa drug cartel. Maybe Washington could tell Guzman it will quit pretending it is going to destroy his monopoly of illegal drugs flooding the streets of the United States if he will do what the U.S. government seemingly cannot do—put an end to ISIS once and for all. Such a deal would put the nation’s narcs out of business, but they aren’t accomplishing much anyway. While they are at the bar congratulating themselves on the two years and umpteen buckets of money they spent putting some major drug dealer in prison, three other street entrepreneurs are vying to take his place. It's been like this since Richard Nixon declared the War on Drugs in 1971.